Growing up, I was that science geek that liked to do my friends' hair and makeup. After working in Veterinary Technology for three years, my creative side was calling me and I decided to go back to school to become a Designer. I fell in love with the industry and knew right away that it was a perfect fit. In 2005, I began working at Mango, and the rest is history! BIT ABOUT ME The most meaningful things to me are my husband, my kids, and my sense of humor. If you can't laugh at yourself, then what good is life? Always a good visit at Mango. Five Stars to Sarah!!! Sarah Clock did my highlights. Great cut! Perfect job on my short hairstyle. Sarah is terrific! Sarah is such a professional! She knows how to figure out what you need/want---even if you don't! I can always depend on her artistic eye! Wonderful cut!!! She listens and gives you the cut you want!!! Sarah is the best.....so real and listens to me. Sarah C was wonderful and I adore her. Sarah is a stylist par excellence!!! Her color mixing is natural but WOW at the same time - really wonderful at her craft!! I received so many compliments the next day about how soft and healthy my hair looked and felt. Sarah is the best, and I absolutely love seeing her! I can’t imagine letting anyone else cut my hair. I’ve never dyed my hair before, and there’s one reason I finally tried - because I know Sarah does everything with great care, and I know I can trust her. Sarah is the best! She always gives me the perfect cut, even when I'm not totally sure of what I want. She has done everything from long layered cuts to short bobs for me and I've never been disappointed. Super satisfied with how light and healthy my hair feels and looks after a this razor cut trim. Sarah did a fabulous job as always! This was my first time at the Mango. Sarah really took her time during the consultation and made me feel totally at ease. I’ll definitely come back to her! sarah was a w e s o m e. very patient, listened well, and more importantly, understood. super efficient, great cut, but never felt hurried or rushed. sometimes it just clicks and works - definitely did today. Sarah is a genius with not only color but hair cuts as well. I always feel like a million dollars after my appointments with her. Perfect new haircut— love it!! Sarah is an incredible stylist...the best of the best. The salon would not be the same without her! The services are always amazing! Your staff are always super friendly and the atmosphere is fantastic! Sarah is the best hairdresser I have ever had. I trust her implicitly. Sarah Clock does an exceptional job in every way. 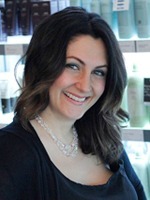 She not only excels in her profession, her people skills surpass all the colorists and stylists I previously had, over many years at Mango on Libbie. She is gracious, honest, efficient, listens well and her personality is authentic. Sarah makes the appointment fun, while taking her job seriously and doing a superb color application. She is a delight and a real talent. I am so glad I switched salons from Libbie to Gayton, and Sarah Clock is the main reason. Thank you, Sarah Clock! Great stylist! Super personality and professional. I will see Sarah again!! Sarah asked good questions about my hair and my goals for my hair. Sarah is an incredibly gifted hairdresser....the best I have ever known. Had a great idea about Cole! Always love my haircuts with Sarah! I usually let Sarah color/highlight my hair however she thinks is best and it always comes out perfect. My cut is always perfect as well. Sarah is great to work with and I always look forward to my appointments with her. Perfect hair cut for me!!!! Sarah is the best I've been seeing her for over 10 years. She is always up to date on the latest hair trends. Sarah ALWAYS asks me how I am doing relative to my hair FIRST, and always adds value! Love her! I enjoyed my visit to Mango this afternoon. Sarah not only provided me with an extraordinary haircut and highlight, but represented the salon in a professional manner. I always look forward to my appointments with her. Sarah was extremely professional and knew exactly what I wanted. Incredibly thrilled and pleased with this experience. She is a genius and the rest of the staff members were incredibly welcoming. Salon was exceedingly clean and inviting. Thank you! Sarah at Gayton Crossing is amazingly talented! Love her! Sarah at Gayton Crossing is exceptional! Love her! Sarah was amazing per usual! She checks in on what is/isn't working and recommends new ideas. I love my cut, and I always enjoy sitting in her chair! Sarah is an incredible hairdresser. Her hair cuts, styling, and coloring are always superior to that of any other hairdresser I have known. Her positive disposition makes every visit a joy. From check-in to check-out, my experience was perfect. The ladies at the reception desk were pleasant, smiling & helpful. I needed to make an appt. change at the Libby salon and Rachel handled it with precision. Sarah always delivers, I am always more than pleased with the color/highlights and the cut I get from her. Customer service was spot-on! Sarah always does a fabulous job-- the best! You have a star stylist in Sarah Clock. She is pleasant, listens to what you want to achieve and delivers. Sarah is an incredible colorist-stylist. I would give her ten stars if such were possible. The color is always well done, and the cut is always superior to any I have had in any other shop. Today, the shampoo tech was delightfully good. Her personality was positive and the experience beyond expectation. Sarah's a wonderful listener and had great suggestions for my hair. She's very knowledgeable and was like Van Gough with the color bowls -- I LOVE my new color and cut! Thank you!! Sarah's a wonderful listener and had great suggestions for my hair. Sarah really listened to what I wanted. She asked questions that I didn't even think of and brought up pictures to show me a variety of options. I really appreciated her taking the time to make sure I was getting what I really wanted. Sarah is so talented and professional. I love the way she cuts my hair. She also worked me in. The booking agent offered to ask Sarah if she could. Thanks to both. Love the receptionist and shampoo gal and coffee. Whole experience so positive. Thank you. Sarah always does such an amazing job and I am so happy to have finally found the perfect stylist since moving to Richmond. Sarah is ALWAYS great about listening to my needs and finding solutions that are perfect for me! Sarah is always awesome. She remained calm when the hair dryer exploded! Sarah was great, as always! I told her I wanted a little change and we talked about options. She showed me some pictures and she helped me decide what look I wanted. Excellent hair cut! I'm definitely coming back. Sarah was very pleasant. I appreciated the phone call advising me that she was running behind so my appointment would be 1/2 hour later. Sarah always does an excellent job with both my cut and color, she's a master with the color and always has lots of ideas to change it up to keep it interesting. Sarah always does an amazing job! Perfect color and so happy with my fresh spring cut. She listens, and gives me great color and cut! Sarah C rocked my color. I've already gotten tons of compliments! Totally worth the splurge to get exactly what I wanted. Taylor did a great job with the shampooing and head massage. Sarah, of course, is amazing with hair! Not everybody can cut/style my hair because it can be a bit overwhelming. Thanks so much Sarah! I sent a referral your way today. A flawless experience. Thank you. Sarah is the ultimate in hair color & cuts. Wouldn't trade her for the world, such a gem. All of the service at Gayton is spot-on & perfect! Was greeted as entered the salon Was welcomed by Sarah in timely fashion. Always a great experience. Sarah, my hairdresser, is phenomenal. She is knowledgeable, professional and personable. She is an asset to Mango Salons. Love love love my hair!! The staff is always so friendly and accommodating, even with a reschedule. And I love the Biscoff cookies. Great haircut ...always great salon...best hairdresser ever! Love the Gayton location & Sarah C. is the best. Everyone is always very courteous and the hairstylist is excellent. Sarah is great! She really knows how to do hair. My hair is not the easiest to deal with because it is so thick. Not everybody can cut it and make it look decent. I've had my share of bad haircuts and I don't mind paying a little extra for a good cut. Sarah always does a fabulous job! Thank you Sarah! smiles on arrival are so nice. offer of water or coffee is awesome. love the new gayton xing decor. booking and check out is fast and pleasant. sarah clark is fun to work with, very eager to listen and help. love how she also shows me make up after a haircut. she never makes me feel like she' s in a hurry. Sarah was a great hairdresser, the best that I can remember. The haircut was perfect...and the color was just what I wanted. From the moment I stepped into the shop, through the time I checked out, my experience was flawless. Thank you! As always, my time with Sarah Valentine was wonderful with beautiful results. Love the Gayton salon. Everyone is great at Mango! Sarah clock as been doing my hair for 11 years. I wouldn't go to anyone else. She's the best! My haircut from Sarah was great as usual.